PARADISE RIDGE - A Genesee-area farm couple say they hope to share a bit of the native Palouse ecosystem with people who fancy wild plants. Starting May 1, Wayne and Jacie Jensen will be selling 18 potted plants representing 9 different species in what they call a Palouse Prairie Flat. The flat costs $54 and the individual plants are intended to be transplanted in town or country to create a native habitat of about 25 square feet. "It's kind of a whole ecosystem," Jacie said of the 6 species of wildflowers and three species of grasses. "There's something about how they help each other. There seems to be some sort of relationship." The Jensens are third-generation grain farmers whose land includes a 100-acre tract on the southeastern edge of Paradise Ridge near Moscow. The acreage includes a native grassland ecosystem where the Jensens have identified numerous native plant species, collected seed, propagated the plants and created a business called Palouse Prariescapes. "When we collect the seeds, we try to collect from all aspects of the ridge," Jacie said. She added the plants are naturally hearty and, given a little water the first year along with diligent weeding, should thrive with little further maintenance. The project has been three years in the making and the initial flat of plants is being called the Pioneer Assortment. 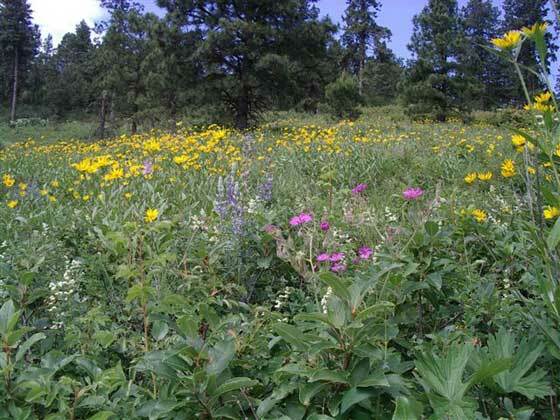 It includes six wildflower species (western aster, blanketflower, slender cinquefoil, tall cinquefoil, goldenrod and prairie smoke) and three native grasses (Idaho fescue, bluebunch wheatgrass and blue wild rye). "We're just excited about sharing the Palouse ecosystem with people," said Jacie, explaining the Jensen's interest in native plants started as more of a hobby, but is now intended as a commercial operation. "It wasn't really supposed to happen this year," Jacie said. But efforts to raise the plants in greenhouses at Plants of the Wild, a nursery near Tekoa, Wash., were successful. So the Jensens decided to get a jump-start on the business venture. There are so many species of plants, Jacie said, they intend to offer different collections each year. She credited members of the Palouse Prairie Foundation and others with helping select and identify the various species. All the plants are perennials and should be located in sunny sites, said Jacie. "They don't like wet feet," she said of the amount of irrigation needed in the first year. "The next year, you shouldn't have to water them. Then keep the weeds out for three years and you've got it made." Think of it, Jacie said, as if during the first year the plants sleep, then creep during the second year and finally leap into the third year. "This is commercial seed production," Jacie said. "We're farmers. That's what we do." The Jensens have cultivated a seed plot of about one acre at an old homestead on their ridge property. All the various species of flowers and grasses are being raised together in rows. Seeds, some of them as large as pumpkin seeds and others smaller than pinheads, are harvested and eventually planted or stored. Bulk seeds will soon be available through Clearwater Seed in Clarkston, Jacie said. "Our goal is to bring a part of our shared heritage to the gardeners and landscapers of this region." Historically, the plants flourished from as far north as the Rathdrum Prairie near Coeur d'Alene south to the Camas Prairie near Grangeville. The Pioneer Assortment flats will be available at the Moscow Farmer's Market, starting May 5, and at the following nurseries beginning May 1: Prairie Bloom Nursery, 5602 State Route 270, Pullman; Fiddlers Ridge Garden, 1420 S. Blaine, Moscow; Westwood Gardens Nursery, 15825 N. Westwood, Rathdrum; and Blue Moon Garden & Nursery, 1732 S. Inland Empire Way, Spokane. The flats may also be ordered online at MaryJane Butters' Web site: www.maryjanesfarm.org.